What a unique combination: Peace Signs and Paisley! 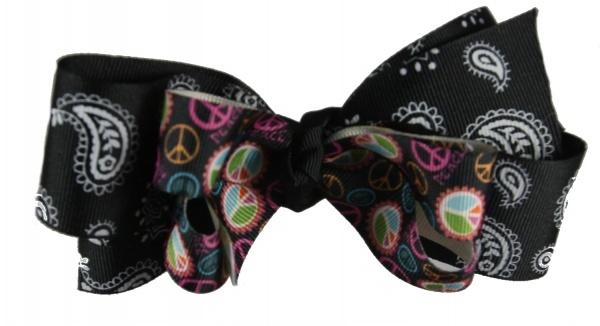 This is a double layer bow that all the girls will adore. It has bright colors of pink, lime green, orange and blue in the peace signs on this black 7/8 inch grosgrain ribbon for the top layer. The bottom layer is a 1.5 inch grosgrain ribbon that is black with white paisley designs all over. Together these are wrapped with a solid 7/8 inch black grosgrain ribbon. Peace Out to the Paisley Lovers!